A sense of adventure and the need for freedom and spontaneity runs in our family, but my in-laws keep beating us to it. While my husband, Russ, and I have been researching and scouting our overseas lifestyle options, with one more year to go (our youngest son graduates high school in 2018), Grandma and Grandpa plunged right in. “While we were in Cancún for dental work, we explored down the coast…and we leased a condo for a year in Playa del Carmen,” says my mother-in-law, Judi Caldwell. Impulsive for a Sunday drive in Mexico? Yes. But not surprising. Ralph and Judi Caldwell are adventurers in their mid-70s, retired from the U.S. Navy. They recently closed up their house in Dahlonega, Georgia, parked their RV in Ocala, Florida, and caught a two-hour flight to Cancún. From there it was less than an hour to Playa del Carmen in a private taxi. Price, $50. They carried everything they needed for the year in two suitcases and two carry-on bags. All-in for a new adventure. Ralph says they are “living in Paradise.” They’re already in the process of arranging their residence visas and extending their lease. Playa del Carmen is on the Caribbean Coast of Mexico’s Yucatán Peninsula—also called the Riviera Maya, which includes Cancún to the north and Tulúm to the south. The internationally diverse city, with a growing population of nearly 200,000, is a popular tourist and expat destination. It’s welcoming, clean and safe, with plenty of shopping, activities, transportation, and services. The climate is warm year-round, usually with a temperate breeze off the ocean. 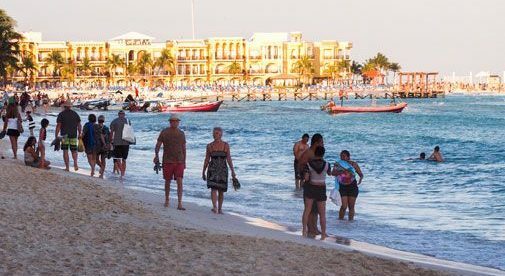 Since property owners can easily rent to higher-paying tourists most of the year, and places near the beach can be expensive, Playa del Carmen is not the cheapest expat area. Their condo is just two blocks from Playa del Carmen’s world-renowned La Quinta Avenida (Fifth Avenue); a three-mile pedestrian stretch of international shops, cafés, galleries, and restaurants. “There’s always something going on along La Quinta,” says Judi, “and the people-watching is fantastic.” They’ve discovered it is much easier, and cheaper, to dine out in Playa del Carmen, than to shop for groceries and make meals at home. It’s more fun, too, since it gets them out and about, meeting people in the community. They’ve discovered favorite brunch and dinner places around town, where they are becoming regulars. Full brunch, including fresh-baked croissants and seasonal, organic, farm-to-table ingredients, is around $10 for two. Dinner is usually a light meal for less than $20, unless they splurge on filet mignon with Chilean wine for $40 (that’s for two people, with leftovers for the next day). They don’t have or need a car in Playa, since almost everything is within walking distance. Taxis are available 24/7 to go a few blocks or across town for less than $5. For longer journeys, there are shared vans called colectivos, or the public bus system, ADO. The buses are clean, comfortable, air-conditioned, and run on a regular schedule throughout the Riviera Maya, for less than $5 to Cancún or Tulúm. Ralph and Judi instantly fell in love with the area, the people, and the more laidback lifestyle. They say it’s hot, but the on-shore breeze helps. To combat the heat, they plan their days around the siesta hours of noon to 4 p.m. They enjoy reading and keeping up with the world online during their downtime. They look forward to exploring up and down the coast when the weather gets cooler. Until then, every evening they go up to the rooftop patio and pool of their four-story building, and enjoy the expansive view of the colorful city, white sandy beaches, and vivid green palm trees rippling in the purple sunset. “Sin arrepentimientos (no regrets),” the happy couple assure.